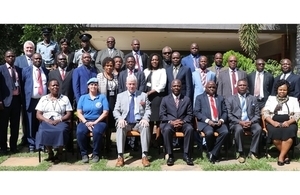 Officers from Malawi's protective services will be practicing multi-agency working ahead of May 2019 elections with support from British Peace Support Team (Africa). Elections are not a domain of Malawi Electoral Commission (MEC) alone. They are a domain of several other stakeholders. It is therefore important to secure support from all key stakeholders and develop a single shared vision on how together we can make the entire electoral process successful. Leader for the Exercise Delivery Team from British Peace Support Team – Africa, Steven O’Donoghue, said the exercise was part of UK’s broader package of support to Malawi to conduct free and credible elections in May. He expressed optimism that Malawi will have a relatively safe election through the strategies put in place by the Malawi Police Service, Malawi Defence Forces and Malawi Electoral Commission. This process this week is to exercise critical decision making in relation to electoral matters over the three phases of the election—this phase we are now, the pre-election phase, the actual election day and thirdly the post-election phase. Apart from supporting the election strategy workshop, the UK has contributed £2.77 million of UK aid to the UNDP-managed Elections Basket Fund (EBF) that supports the electoral body, MEC, to deliver credible election. The UK also contributed £1.5 million in UKAID’s joint contribution with USAID to improve the credibility and integrity of the 2019 elections by supporting civil society oversight and civic voter education.